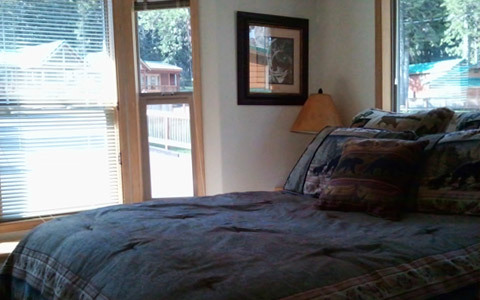 Sleeps 4 - $149/night Queen in master. Queen & twin in loft. Hot tub. Base rates are based on (2) person occupancy. Add $10.00 per each extra person or pet, non-smoking cabin. 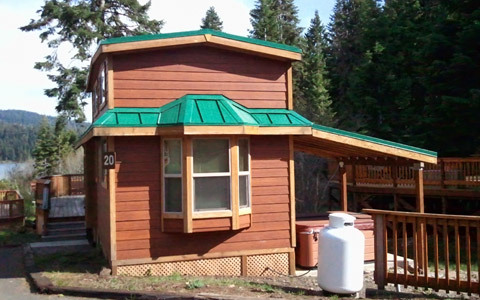 A creekside two-story, this cabin offers a panoramic view of the lake and surrounding mountains. Additionally, the wrap-around porch overlooks a bubbling brook that is nestled among the trees, providing calming morning shade. The front porch contains a café table with seating for the family and ample area for dinning outside after cooking on the deck-side barbecue. The hot tub is located behind the unit under a canopy with access from the porch and provides for a secluded spa experience while listening to the brook. 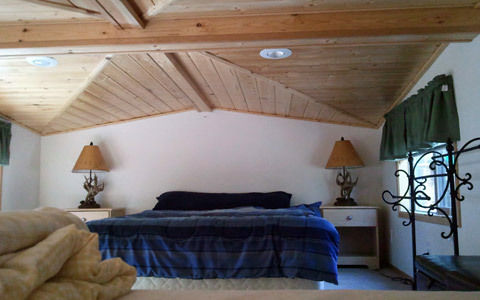 The cabin features a queen bed in the master bedroom and in the sleeping loft a single and a double bed. 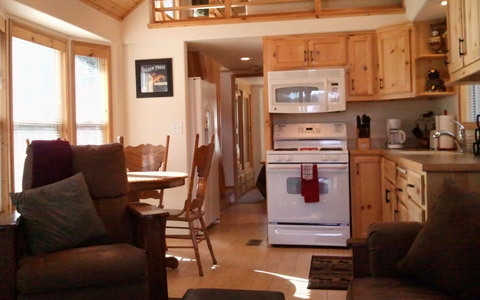 With ceiling and cabinets finished in bright knotty-pine, the cabin gives the pleasant feel of a cabin in the woods. The cabin also features DirectTV for all your favorite television shows. The kitchen contains a full-range, a microwave and a two-door refrigerator with ice-maker. The durable furniture and the woodland theme throughout make this an ideal cabin for a small family or the sportsman who is looking for a break from the confines of a tent. Parking is at the side of the cabin. 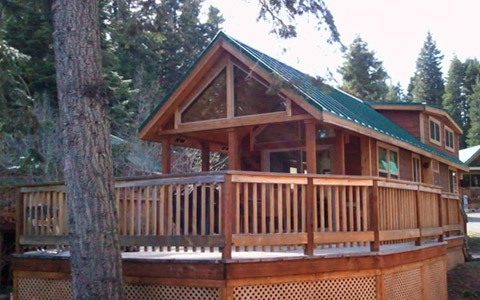 The front porch is shaded by a large pine and overlooks a small meadow where guests can observe the local deer. There is also a view of the lake from the porch, the cabin is right on the creek and the sound of rushing water can be enjoyed from the hot tub.